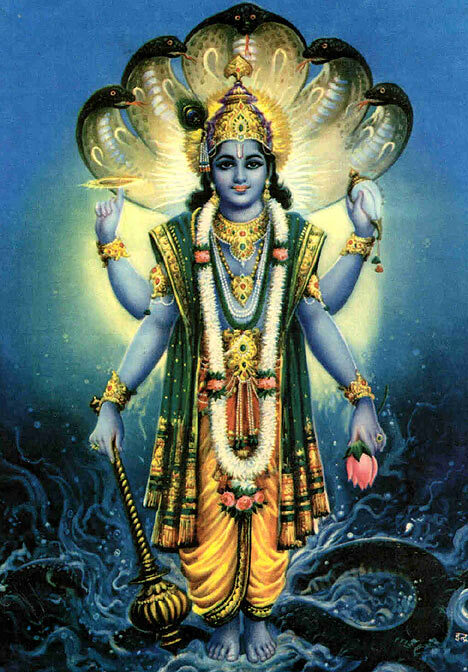 In this Part we will explore the meaning of the Ninth Shloka of Sri Vishnu Sahasranamam. The Lord is the controller of the Universe who makes things happen at His Will. He has giant strides and is ever so courageous, He is Rama amongst wielders of the ‘bow’. He is a ‘Medhavi’ or fountainhead of knowledge on all subjects and has a gigantic memory. He travels around the world on his Garuda Vaahana, the King of birds and He is the force behind all movement. He is unparalleled and unexcelled, and is invincible, yet He is grateful to his ardent devotees showering his kindness and compassion. He dwells in all of us and is Omnipresent. This Nama first appeared in 4th shloka. 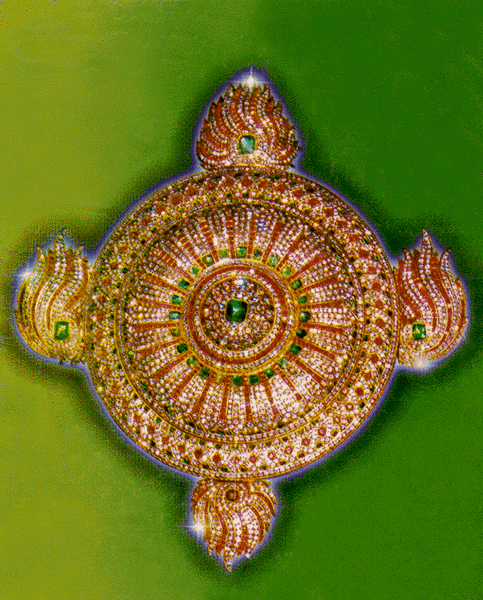 “Sambhavo bhaavano bhartaa prabhavah prabhur Ishvarah….” as the 36th naama. The current occurrence is interpreted by Sri Adi Sankara as ‘Sarva Shaktimattayaa Ishvarah – He is Ishvara because he is all powerful. In this verse Ishvarah is explained as – the one who has unlimited powers with enormous self-control and gets whatever HE ‘Wills‘. In the earlier part of the Vedas a lot of emphasis was placed on the Karmas or the rituals. The Mimamsakas (philosophers) went to the extent of saying that Karma is everything. However Vedantins like Sri Adi Sankara argued and established that Ishvara has overriding powers over Karma. Without the will or Sankalpa of Ishvara, Karma is just an empty ritual. 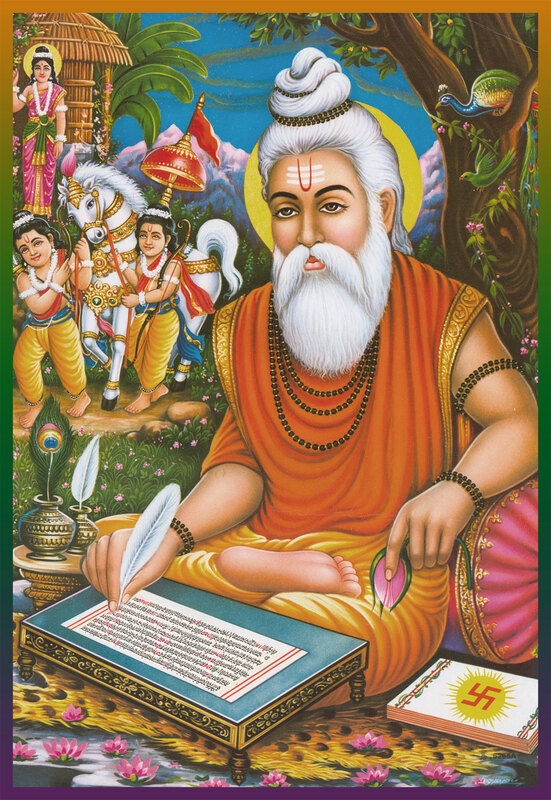 In this Nama, Bhagavan is shown to be the real source of power and not Karma. He who is ever a courageous One, is Vikrami. Sri Parasara Bhattar points out that the name signifies His Nature and dispels all possibilities of anything going against His Will or desire. Vikrami also refers to Bhagavan’s Vamana Avataar. Vikrami is one who has the “Special” footsteps referring to his transformation from the dwarf Vamana to the gigantic Trivikrama resulting in his giant strides. Vikrama means valour or bravery. Vikrami is a person of great courage and valour. Sri Adi Sankara says ‘Vikramah Shouryam Tadyogaat Vikrami – He is called Vikrami because of his great valour’. The Puranas describes that Vishnu descended as a Vamana (Dwarf Brahmin) to restore the authority of Indra over the heavens, as it had been taken over by Mahabali, a benevolent Asura King. MahaBali was the great grandson of Hiranyakshipu and the grandson of Prahlada. King MahaBali was a generous man who engaged in severe austerities and penance and won the praise of the world. This praise, from his courtiers and others, led him to think of himself as the greatest person in the world. He believed that he can help anyone and can donate whatever they ask. Even though he became benevolent, he became pompous of his activities and forgot that the Almighty is above him. Dharma says that one should do his duty without any pride and helping others is the duty of a righteous King. Mahabali was a devoted worshiper of the Lord. The Story amply demonstrates that the Almighty, the ParaBrahmam is neutral and unbiased; He only tries to balance nature. He showers his divine light to all, irrespective of what they do. Vamana, in the guise of a dwarf Brahmin carrying a wooden umbrella, went to King MahaBali’s Yagna to request three paces of land. Mahabali consented, against the warning of his Guru, Shukracharya. Shukracharya, annoyed with the pride of the King, shrinks himself with his powers and sits in the spout of the Kamandalu, from which water has to be poured to seal the promise to the deity in disguise. Lord Vishnu, in disguise as the dwarf Brahmin, understands immediately, and picks up a straw from the ground and directs it up the spout, poking out the left eye of Shukracharaya. Since then, the guru of the Asuras has been known to be half blind. Vamana then revealed his identity and enlarged Himself to gigantic proportions to stride over the three worlds. He covered heaven to earth with the first step and earth to the netherworld with the second. King Mahabali, unable to fulfill his promise, offered his head for the third step. 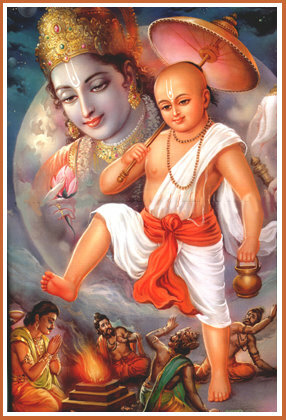 Vamana then placed his foot and gave the King immortality for his humility. For the humility shown by MahaBali in keeping his promise and giving due recognition for his ancestor Prahlada, the Lord conceded sovereignty of Patala, the netherworld to MahaBali. The giant form of Vamana is known as Trivikrama. Just before King Mahabali was sent to Patala Loka, he was given permission by Vamana to visit his people once a year. 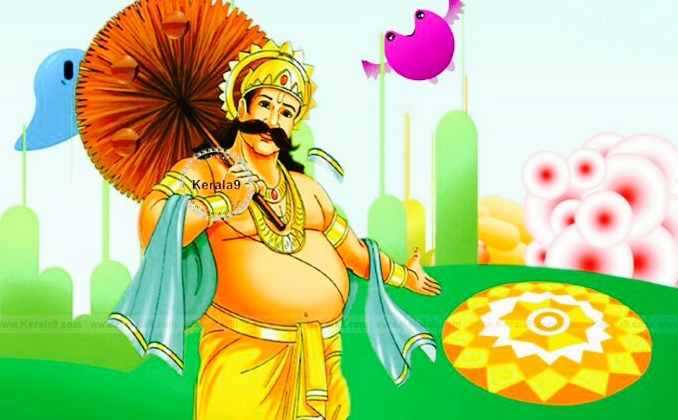 The Onam festival is celebrated to welcome MahaBali back to his lost Kingdom. During this festival, beautiful floral decorations are made in every house and boat races are held throughout Kerala. A twenty-one-course feast is an important highlight of the Onam festival known as the ‘Onam Sadhya’. Basically this means the wielder of the bow. 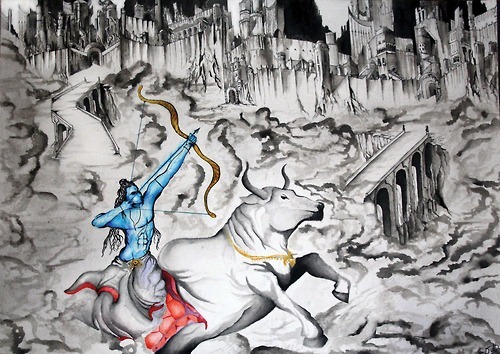 ‘Dhanurasya asti iti Dhanvee – He is called Dhanvee because he wields the bow expertly. 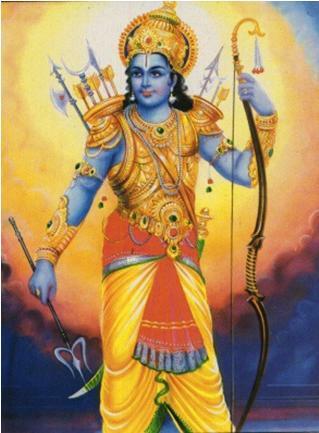 His bow is the great ‘Saarnga’ because of which the Lord is also called ‘Sarangapani’. Later in in the forest Janasthana he is able to destroy fourteen thousand demons using only his Kodanda unassisted by even Lakshmana. Finally of course he vanquishes the mighty Ravana using the power of his bow. In the Bhagavad Gita, Bhagavan says ‘Ramas shastra bhritaam aham – I am Rama among the wielders of the bow’ (Chapter 10 Verse 31). 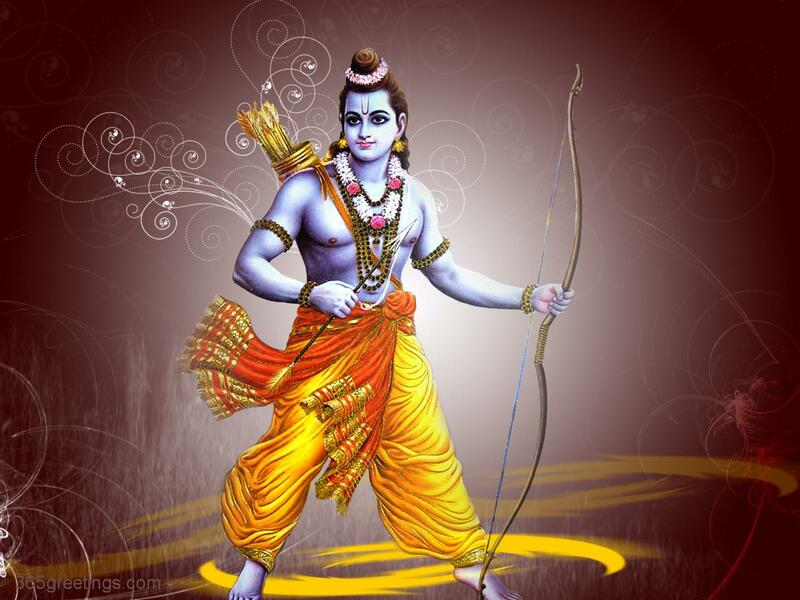 In Rama Avataar, His bow is known as ‘Kodanda’ and hence Rama is also known as ‘Kodandapani’. Thyagaraja extols Rama by saying ‘oka baanamu, oka shabdamu, oka patni – He is a person of one arrow, one word and one wife’. Thus the Lord is described in the 108th Shloka as “Vanamali Gadhi Sharngee Shangi Chakree cha Nandaki”…..signifying the ‘Panchayudam’ of His Five weapons. The Panchayudam Stotram, glorifies the Lord and is a salutation and surrender to His divine weapons. Medhavi is a person who combines great memory with great intelligence. Sri Adi Sankara says ‘Medhaa bahugrantha dhaarana saamarthyam, sa yasya asti sa medhavi – Medha is the ability to grasp several ideas on different subjects at the same time; One who has this ability is naturally a Medhavi’. 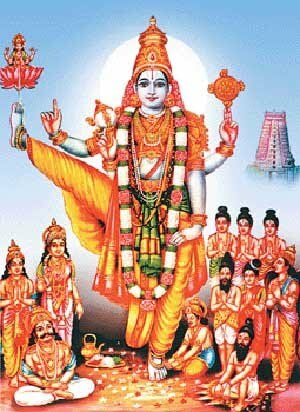 When a Bramhachari performs Samitha Dhanam (twig offering to Fire or Yagna), the first blessing he prays to receive from Agni Bhagavan is ‘Medhavi Bhooyaasam – Let me be endowed with good memory and intelligence’. There are of course other things like ‘Tejasvee, Varchasvee, Bramhavarchasvee, Aayushmaan and Annadah’ but for a student, being a ‘Medhavi’ comes first in the list of priorities! This name can be interpreted in 4 different ways. A person of great Valour as in the earlier Nama Vikrami (76th naama). A person of Giant Strides (Trivikrama Avataram). A person who helps you to cross the Ocean of Samsaara. A person who uses the bird Garuda as his carrier. In Sri Adi Sankara’s words this is explained as ‘Vina Garudena Pakshinaa Kramaat – He moves around on the bird Garuda’. ‘Vi’ refers to the King of birds, Garuda; and ‘Krama’ refers to His Sanchara or flight on the Garuda around the World. This Nama has 3 possible meanings. c) One who is highly prosperous. Krama means order so He brings order to the chaotic Universe. Krama also means movement hence the meaning applies to Motion. According to Panini Sutra 1.3.38, which reads “vrtti-sarga-taayaneshu kramah”, krama also can indicate continuity, energy, or good progress or development. 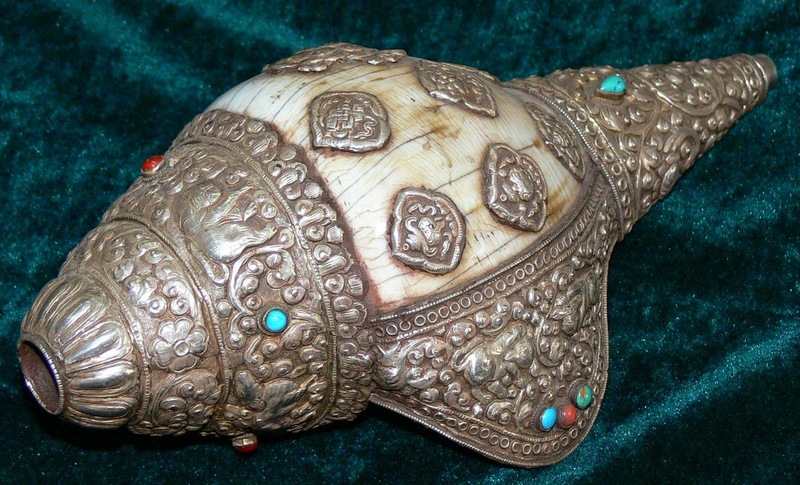 Sri Bhattar uses the last of these, and gives the meaning “One who has great prosperity”. Anuttamah is somebody who has no superior or higher entity above himself, i.e., He is the highest or the Supreme entity. 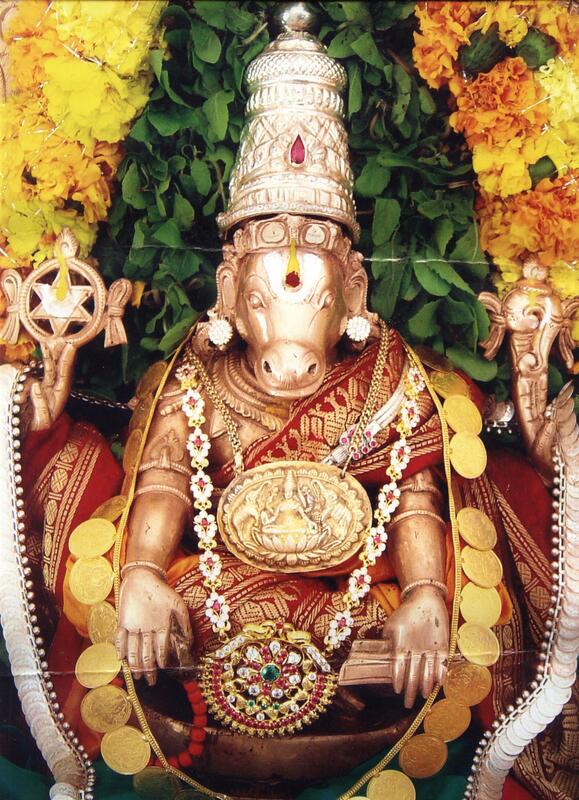 Sri Adi Sankara says ‘Avidyamaanah uttamah Yasmaat sah Anuttamah – One whose Superiorsare non-existent’. Narayana Upanishad says ‘Yasmaat param Naaparam asti kinchit – There is no other force above Him. He is Supreme’. 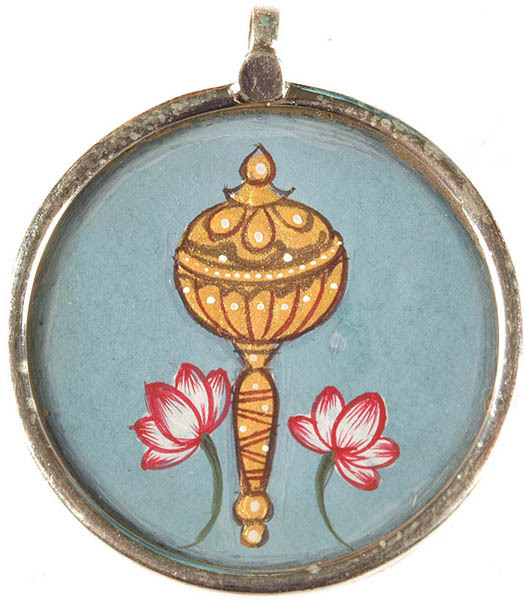 Adharsha means being overcome or being vanquished. So Duraadharshah essentially means that the Lord is Invincible. ‘daityaa dhibhih dharsha yitum na sakyata iti duradharshah’ – One who cannot be overcome by the demons and others. He can only be overcome by total surrender and Bhakti. This aspect is explained in the next Nama. Kritajnah is a person of great gratitude or one who appreciates even the smallest act of devotion and responds greatly to it. Meaning: Even if someone makes a humble offer of a leaf, a flower, a fruit or even water I take it with pleasure provided it was rendered with Bhakti. In Srimad Bhagavatam, Kuchela gives Krishna a handful of poached rice and gets a Kingdom in return. He is ever so grateful to his devotees. He came rushing to the aid of Draupadi when she cried for help uttering “Govinda”. He lifted the Govardhana Giri to save the people and animals of Vrindavan from Indra’s fury. If even the most sinful man worships Me with undivided devotion, with worship as the only purpose, such a person must be considered highly righteous. Bhagavan in Chapter 18 Verse 66 of the Bhagavad Gita again shows his kaarunya bhaava by reiterating with his Charama Shloka. Setting aside all meritorious deeds (Dharma), just surrender completely to My will (with firm faith and loving contemplation). I shall liberate you from all sins and grant you Moksha. Do not fear. Bhagavan is so grateful that the mere worship of Him with sincerity is sufficient for Him to forgive all other sins committed by the worshiper. By surrendering to Him and worshiping him one can attain liberation or Moksha from this Samsara. Kritajnah also means someone who keeps a tab on every act of every person. In the words of Sri Adi Sankara ‘Praaninaam Punyaapunyaatmakam karma kritam Jaanaati iti Kritajnah – He is called Kritajnah because He keeps an exact account of the good and bad deeds of all beings’. He is responsible for the actions of all. He is the Cause of Causes. We may think we are the Kartaa or the Doer but it is all His Kriti, triggering the inner force of action. The light bulb which glows is the Karta but the glow is actually the Kriti of the electricity which is flowing through the bulb. In Tamil there is a saying – ‘Avan Inri Oru Anuvum Asayadhu’ – Without his grace not even an atom can move! He is the real Owner and Controller of the Souls of those who act virtuously, hence He is Atmavaan. Our sincerity of devotion, trust, and surrender unto Him will become the sole cause of our salvation. He is the kritajna pleased by our immensely small effort of sincere devotion, and He will cause our souls which He owns, and divert it towards actions that He Wills and then use that as the reason for conferring His blessings on us. He is completely independent and does not need help from anyone. Sri Adi Sankara says ‘Sva Mahima Pratishthitatvaat Aatmavaan – He is Aatmavaan because he is firmly established in his own greatness’. In Chandogya Upanishad it is said- ‘Sa Bhagavan Kasmin Pratishthitah iti sve Mahimni’ – Where is that God rooted? In his own Glory! The Lord is ‘Ishvara’, as He is the controller of the Universe who makes things happen as He Wills. He is Courageous and hence called Vikrami. HE is Rama amongst the wielders of the ‘bow’ and hence He is Dhanvi. He is a ‘Medhavi‘, fountainhead of knowledge on ALL subjects with a gigantic memory. HE travels around the world on Garuda, the king of birds and HE is the force behind all movement, so he is known as Vikramah. He maintains order in the Universe, so He is Kramah. HE is unparalleled and unexcelled, so Anuttamah. He is invincible and hence He is called Duradharsah. He is grateful to his ardent devotees and always showers his kindness and compassion, hence He is Kritajnah. He is the force behind all actions and hence he is Kritih. He dwells in all of us and is omnipresent, so He is Atmavan. Thank you Divya for your kind comments. very good post. the audio commentary was impeccable. the music and the pictures were very apt. Thank you for your kind words. Your regular encouraging comments gives us the impetus to do more! Many thanks for that. Audio commentary summarises the sloka beautifully. The background music (flute)sounds so divine and very apt for Sri Krishna. Thank you. The new feature of the background score in your audio commentary adds a touch of meditative quality to the post. The serene music enables to concentrate on what is being said. Good post! “pleased by our immensely small effort of sincere devotion, and he will cause our souls which He owns, and divert it towards actions that He wills and then use that as the reason for conferring His blessings on us.” How very true? !